The department of Computer Science and Engineering was started in the year 1993 with an initial intake of 60 students in the under graduate program. The department strives to achieve its vision by its highly qualified and dedicated team of faculty. To promote higher education, M.E (Computer Science and Engineering) and Ph.D., was started in the year 2008. Computer Science and Engineering is leading the way in revolutionizing and making the current digital world a reality. The department is equipped with state-of-art computing facilities to impart practical exposure to the students in the recent advancements in the field of information technology. Final year students are offered placement and personality development training programmes to augment their technical and behavioral skills. The department has an excellent placement record and our major recruiters are Amazon, Wipro, Infosys, HCL, Maersk, Syntel, Odyssey, Sans Peril, CSS, Sutherland, QSpider, Maxit, etc., Besides looking forward for employment opportunities, our students also show keen interest in pursuing higher studies. Our alma mater are pursuing their higher studies in reputed institutions like Anna University, IMT Hyderabad in India and abroad. Vellore Institute of Technology, Chennai. PO1:Apply the theoretical and practical skills acquired in analyzing real time complex industry problems and provide technical solutions to it. PO2:Choose the appropriate programming language, modern ICT technology and tools required to solve a problem. Develop and test the programming code as per the industry requirements and standards. PO3: Understand the impact of professional technical solutions provided to a problem in the context of societal and environmental well being and suggest sustainable measures for development. PO4: Utilize the knowledge gained on trending topics in the IT industry such as Data Analytics, Artificial Intelligence, Cloud Computing, Internet of Things, Social Network Analysis that will enable them to work in complex industry problems. PO5:Quickly adapt to the new technology and development in the IT industry and communicate effectively in deliberating their duties as an individual or as a team. PSO1:Gain theoretical and practical knowledge in various core and current trending topics in IT industry such as Software Engineering, Database Management Systems, Machine Learning, Artificial Intelligence, Theoretical Computation, Cloud Computing and Data Analytics that would make them Industry ready. PSO2: To emphasize on learning-by-doing by giving practical training on emerging Information and Communication Technologies (ICT) and encourage their acquaintance with industry through internships and industrial visits. PSO3: Understand, analyze and develop solutions by applying professional engineering practices and use open source programming environment. To encourage quality research and development activities by providing the state-of-art facilities. PSO4: Learn about professional ethics and develop their skills to work effectively as a individual or as team. PSO5:To inculcate social responsibility by encouraging them to take part in societal development activities. Various courses in this program and its syllabus are framed by IBM in association with SPIHER. Students will be trained on industry standard IBM platforms that will provide the students firsthand experience on commercial setup. IBM supports the students to enhance their learning experience by providing inplant training and internships. IBM extensively supports students projects by assigning and guiding them to work on real world industry problems. 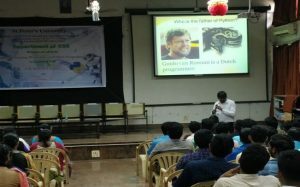 PSO2: To emphasize on learning-by-doing by giving practical training on advanced topics in the domain of Computer Science and Engineering and to encourage team effort in lab courses. PSO3:Understand, analyze and develop solutions by applying professional engineering practices and use open source programming environment. PSO4: To give more importance to the project work undertaken by the students that will encourage them to undertake quality research and development activities in their future career. PSO5: To develop the culture of team work and effectively communicate with the team members. Ph.D – COMPUTER SCIENCE AND ENGINEERING BASIC COURSE DETAILS Our department offers Ph.D degree course in Computer Science and Engineering. A Ph.D in computer science is a research degree that builds on students’ existing knowledge researching, developing, implementing and maintaining information systems. It deals with new and developing technologies in the field of computer engineering. Research study in computer science and engineering will enable the candidates to work on exciting projects that have life-changing implications for people. To purse research candidates should posses T shaped knowledge, having good understanding of wide range of topics and exploring in depth the topic of specialization. All sciences are somehow influenced or impacted by computer science, so by getting involved in this field, one could pursue careers in a vast majority of fields such as business, entertainment, etc., SCOPE, JOB OPPORTUNITIES AND SALARY DETAILS Computer science doctoral degrees can lead to several employment opportunities, such as computer hardware engineer, College/University professor and computer and information research scientist. Job opportunities are available in Research and development divisions in government and private sectors. Starting salary lies in the range of 12-24 lakhs per annum. Workshop on Hands–On Training in Python Programming was organized by the department of CSE during 12th, October 2017. Around 150 participants has participated in the event. 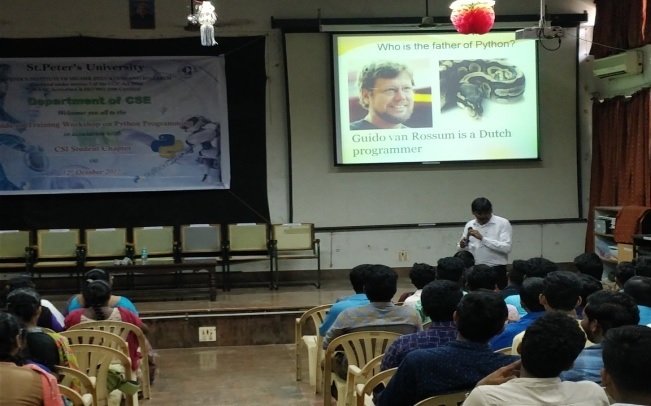 Mr. Mohan and Ms. Meena, Professors from Prathyusha Engineering College has trained the participants in developing Python programs. Vision To achieve technical excellence in Computer Science and Engineering education imbibed with moral values that will enable the students to meet the societal needs scientifically and ethically. Mission To provide high quality technical education and training that fosters innovative skills among the students to keep pace with technological advancement and to fulfill the requirements of the industry in the global scenario. A memorandum of Understanding was signed on 28-03-2017 between St.Peter’s Institute of Higher Education and Research and Confirmatics Business Solutions, Chennai to facilitate Industry-Institute interaction for the benefit of the student community and the research and development activities. A memorandum of Understanding was signed on 28-03-2017 between St.Peter’s Institute of Higher Education and Research and Sai Smart Kidz Pvt. Ltd., Chennai to facilitate Industry-Institute interaction for the benefit of the student community and the research and development activities. A memorandum of Understanding was signed on 30-10-2015 between St.Peter’s Institute of Higher Education and Research and Firstsoft Technologies Pvt. Ltd. Chennai to facilitate Industry-Institute interaction for the benefit of the student community and the research and development activities. A memorandum of Understanding was signed on 28-10-2015 between St.Peter’s Institute of Higher Education and Research and Aadhityaa Infomedia Solutions Pvt. Ltd. Chennai to facilitate Industry-Institute interaction for the benefit of the student community and the research and development activities. A memorandum of Understanding was signed on 06-02-2014 between St.Peter’s Institute of Higher Education and Research and CMC Academy Pvt. Ltd. for the benefit of the student community and the research and development activities. A memorandum of Understanding was signed on 03-02-2014 between St.Peter’s Institute of Higher Education and Research and NIIT Ambattur for the benefit of the student community and the research and development activities. A memorandum of Understanding was signed on 03-02-2014 between St.Peter’s Institute of Higher Education and Research and NACE Solutions Pvt. Ltd for the benefit of the student community and the research and development activities. A memorandum of Understanding was signed on 03-09-2011 between St.Peter’s Institute of Higher Education and Research and Infosys for the Infosys Campus Connect Program to benefit the students of CSE/IT departments. A memorandum of Understanding was signed on 07-07-2010 between St.Peter’s Institute of Higher Education and Research and 1Ventures Pvt. Ltd., for the benefit of the student community and the research and development activities.